This card comes gift wrapped! Well, not quite, but it’s got a bow, so it’s halfway there. And, if you like, it can come with your brand on centre stage, too! We’ve kept the design minimal so that it doesn’t look too crowded should you choose to add your own logo. 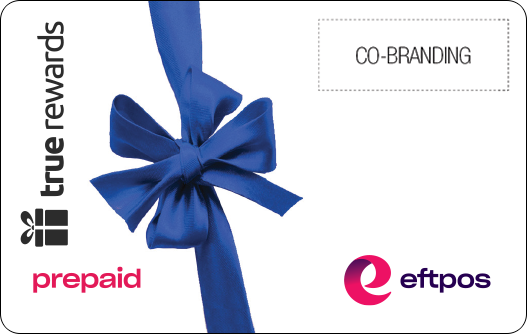 This eftpos gift card comes with the option to be fully, or co-branded, meaning that you can have any of the following: your logo, your logo and ours, or just our logo. Choose based on your campaign needs, or ask our customer service staff for their recommendations.